Exploring the idea of luxury in relation to a series of neighboring but distinct concepts including avarice, excess, licentiousness, indulgence, vitality, abundance, and waste, this study combines intellectual and cultural historical methods to trace discontinuities in luxury’s conceptual development in seventeenth-century England. The central argument is that, as ’luxury’ was gradually Englished in seventeenth-century culture, it developed political and aesthetic meanings that connect with eighteenth-century debates even as they oppose their so-called demoralizing thrust. 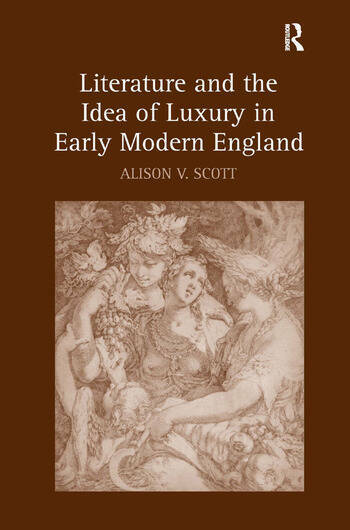 Alison Scott closely examines the meanings of luxury in early modern English culture through literary and rhetorical uses of the idea. She argues that, while ’luxury’ could and often did denote merely ’lust’ or ’licentiousness’ as it tends to be glossed by modern editors of contemporary works, its cultural lexicon was in fact more complex and fluid than that at this time. Moreover, that fuller understanding of its plural and shifting meanings-as they are examined here-has implications for the current intellectual history of the idea in Western thought. The existing narrative of luxury’s conceptual development is one of progressive upward transformation, beginning with the rise of economic liberalism amidst eighteenth-century debates; it is one that assumes essential continuity between the medieval treatment of luxury as the sin of ’luxuria’ and early modern notions of the idea even as social practises of luxury explode in early seventeenth-century culture. Alison V. Scott is a senior lecturer in the School of English, Media Studies, and Art History at The University of Queensland, Australia. She is also the author of Selfish Gifts: The Politics of Exchange and English Courtly Literature, 1580-1628.